The keeping of law and its relationship to salvation and pleasing God has been a contentious topic in Christianity from the beginning. It was a major concern in the first century Church as seen in the letters of Paul and the book of Acts. It has continued to be an issue in the Church over the past 2000 years often dividing fellowships, families and friends. In these essays we will look at the dynamics of this issue and determine what is and what ain’t. To the Roman church Paul said, “For sin shall not be your master, because you are not under law, but under grace.” (Romans 6:14). Paul follows up this statement by saying, “What then? Shall we sin because we are not under law but under grace? By no means! (Romans 6:15). Apostle John identifies sin as the breaking of law (1 John 3:4). 1 John 3:4: Everyone who sins breaks the law; in fact, sin is lawlessness. If sin is lawlessness and we are not to sin, there must be law that we are obligated to obey. So what does Paul mean in saying sin shall not be our master because we are not under law but under grace while at the same time saying we are not to sin which Scripture shows is the breaking of law? Law, as it pertains to humans, is generally seen as a system of rules of conduct recognized as necessary for responsible and acceptable human behavior. This is often referred to as moral law. It could also be called behavioral law. Prohibition against murder and theft is an example of such law. We have civil law that governs societal behavior. A speed limit is an example of such law. We have physical law which are rules that govern the workings of the physical universe. Often deduced from the observation that given certain conditions, a particular phenomenon always occurs in the same way. The law of gravity is an example of physical of law. We have religious law which often consists of worship regulations and procedures for expiating sin. Such law is often derived from the writings of religious leaders who claim special insights as to what is required by the supernatural. The Biblical Scriptures reveal Divine Law. Divine Law is law established by God. Divine physical law was established at creation of the universe. It was established to facilitate how the universe operates. Divine moral or behavioral law is seen as operative since the creation of beings given the ability to make choices as to how they behave. While it can be argued that the breaking of any behavioral law, human or divine, is sin the Scriptures primarily identify the breaking of Divine behavioral law as sin. Sin is seen as any behavior that is contrary to the requirements of Divinely established behavioral law. The Scriptures reveal that both humans and angels can and have sinned. We see human sin identified early in the Bible. We see from the beginning that murder was considered sinful behavior when Cain killed Abel. God told Cain, "If you do what is right, will you not be accepted? But if you do not do what is right, sin is crouching at your door; it desires to have you, but you must master it" (Genesis 4:7). Cain choose not to do right and it led to he killing his brother Able. When Potiphar’s wife tried to seduce Joseph he said, “How then could I do such a wicked thing and sin against God?" (Genesis 39:9). Adultery was considered a behavior contrary to God's will and therefore it was considered sin The residents of Sodom and Gomorrah are described as having committed grievous sin (Genesis 18:20). The book of Jude identifies this sin as sexual immorality. This tells us from early on there were laws governing sexual behavior and to violate such law was to commit sin. God brought the flood in Noah’s day because of sin. From the beginning we see sin used as the designation for behaving contrary to Divinely established rules of conduct. Genesis 26:5: Abraham obeyed me and kept my requirements, my commands, my decrees and my laws. At the time of the exodus of Israel from Egypt, we see a rather complicated mixture of moral, civil and religious law established within the context of a Covenant relationship between God and Israel. At the heart of this Covenant system was a grouping of ten laws which were called the Ten Commandments. Exodus 34:27-28: Then the LORD said to Moses, "Write down these words, for in accordance with these words I have made a covenant with you and with Israel." And he wrote on the tablets the words of the covenant-the Ten Commandments. Deuteronomy 4:13: He declared to you his covenant, the Ten Commandments, which he commanded you to follow and then wrote them on two stone tablets. 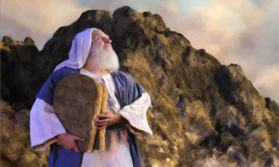 In addition to the Ten Commandments, Moses was given many additional categories of law governing everything from interpersonal relations and dietary practices to hygiene, farming practices and disease control. Worship regulations included a demanding sacrificial system, the keeping of the Sabbath, various festivals, new moon observances and a complicated system of ceremonial washings. Circumcision was established as a covenant sign between God and Abraham and continued as such within Israel (Genesis 17:9-14). Keeping of the weekly Sabbath was established as a sign of the covenantal relationship between God and Israel (Exodus 31:13-17). A Priesthood was established to facilitate strict protocols for carrying out the worship requirements of the covenant and enforce the covenant in general. It’s apparent that many of the laws that made up the Covenant between God and Israel were extant prior to its establishment. We see moral law in operation from the time of Adam and Eve. We see sacrifices to God established as worship protocol from the beginning. The law of circumcision began with Abraham. In Deuteronomy 11:1 the Israelites are told to love the Lord their God and keep his requirements, his decrees, his laws and his commands. This is the same sequence of regulations as found in Genesis 26:5 regarding Abraham. It is evident the Covenant with Israel was a mixture of preexisting laws and new laws established under the covenant God made with Israel at Sinai. A good example of moral law included in the Covenant with Israel and in operation from the beginning of human existence is seen in Leviticus 18. Here we find numerous regulations pertaining to proper sexual conduct. Leviticus 18 teaches that it was the violation of these laws that defiled the Gentile nations surrounding Israel. Leviticus 18:24-25: Do not defile yourselves in any of these ways, because this is how the nations that I am going to drive out before you became defiled. Even the land was defiled; so I punished it for its sin, and the land vomited out its inhabitants. This clearly shows that these sexual conduct laws had application to all peoples and where not laws for Israel only. These were not some new laws that were being introduced to Israel as part of the Covenant. These were preexisting laws that were added to the covenant. Breaking these laws regarding sexual relations could not have defiled the nations surrounding Israel unless they applied to those nations. It is apparent God was simply reconfirming these sexual conduct laws by including them in the Covenant He was making with Israel so they would not repeat the sins that defiled the Gentile nations. It is very apparent that there was moral law extant from the beginning and this law became incorporated into the Covenant made with Israel. It is also very apparent that there was much additional law incorporated into this Covenant that was not extant prior to the establishment of the Covenant. This included a great deal of religious law. While religious law such as sacrifices and circumcism were extant prior to the establishment of the Covenant with Israel and subsequently incorporated into that Covenant, there is no Scriptural record of Sabbath keeping, the keeping of Feast Days, New Moons, or other such regulations extant prior to the establishment of the Covenant with Israel. The Scriptures give no hint of the nations surrounding Israel or pre-Covenant Israel becoming defiled because they didn’t keep the Sabbath, Holy Days, or any of the other religious regulations of the Covenant. These requirements appear to have begun with Israels escape from Egypt and they became incorporated into the Covenant made at Sinai. Even though Israel agreed to obey the requirements of this Covenant between them and God, they were never able to do so in any consistent manner. After the death of Solomon, Israel split into the northern Kingdom of Israel and the southern Kingdom of Judah. Both Kingdoms continued to miserably fail to keep the Covenant. Israel was eventually invaded by the Assyrians and its people were dispersed among various nations. Judah was invaded by Babylon and taken captive. After 70 years the captives in Babylon were allowed to return to their homeland and rebuild the temple. This temple was greatly remodeled during the reign of Herod the Great who made it into the magnificent structure that stood when Jesus was born in the Judean town of Bethlehem. By the time of Christ, the religious leadership of Israel had split into various parties and had added many additional regulations to the Covenant law. Scripture shows that a New Covenant was to be inaugurated with the coming of the Messiah. This New Covenant would be a spiritual Covenant in so much as Gods law would be written in the heart and not on tablets of stone. The implication is that Gods law would become a natural expression of righteous behavior and not just a mechanical reaction to a written code. God’s law would become part of ones very fabric of conscience. Our behavior would be motivated by genuine concern for the welfare of others and not just the avoidance of penalty for failing to keep law. This brings us back to Paul’s statement about us not being under law but under grace and yet being obligated to avoid sin which is the breaking of law. What law are we not under and what law must we obey in order to avoid sin? What law is it that is written in the heart under the New Covenant? What does it mean to not be under law but under grace and yet not sin which means keeping law? When Paul speaks of law in his various writings, it is evident that at times he is speaking of law in general and at other times he is referring to the Old Covenant as a specific body of law or some portion thereof. It is clear that regardless of how Paul references law, he maintains that keeping law is not what justifies us with God. This was a major change in how God was dealing with His human creation. Under the Old Covenant, a proper relationship with God was dependent upon obedience to the Old Covenant law. It was a relationship based on works. Even Gentiles believed that what they did in relation to their various deities was critical to a right standing with such deities. What Paul was introducing was a new way of relating to God. This was a huge change of paradigm and the shift to this new paradigm did not come easy. While the Christ event facilitated establishment of a New Covenant, the Old Covenant didn’t just suddenly cease to be. Adherence to this system of law continued another 40 years until A.D. 70 when the temple and priesthood were destroyed during the Roman/Jewish war. The destruction of the temple effectively ended the means to facilitate the sacrificial system and many of the ceremonial requirements of the Old Covenant. Paul spent much of his time trying to convince his contemporaries the old system was no longer applicable and that a new system was being established that involved a different approach to God. The Old Covenant provided for blessings and a relationship with God based on Israel’s obedience to the laws contained in that Covenant. Israel failed miserably in keeping their part of the agreement. Paul showed this failure was not the fault of the Old Covenant law but resulted from mans inability to keep it. Paul shows God established a new system where we can have a relationship with Him based not on what we do but on what Christ Jesus did. This relationship would involve forgiveness of sin (grace) and the indwelling of God’s Spirit to facilitate expression of love which would fulfill the law. When Christ died, the veil in the temple was torn from top to bottom signifying the end of the need for the Old Covenant system as the pathway to a relationship with God. When Paul speaks of not being under law he is speaking of not being under law as a means of establishing a relationship with God. That approach was tried with Israel and it didn’t work. Paul was teaching a new approach. Paul taught we can establish a relationship with God not by what we do but by what Jesus did. Paul makes it very clear, however, that this change in how we relate to God does not do away with our obligation to obey law. The question that must be answered is what law are we obligated to obey? Law has been around since Adam and Eve. The Old Covenant contained a specific configuration of moral, civil and religious law which if adhered to would facilitate a harmonious relationship with God. The New Covenant facilitates a relationship with God based on Christ’s atonement for sin but also speaks of God’s laws being written in our hearts. What law is written in our hearts? How does it differ from the law given to Israel? It is generally recognized that religious regulations involving animal sacrifices, extant under the Old Covenant and going back as far as Abel, were fulfilled in Christ. The shedding of the blood of animals prefigured the shedding of the blood of Jesus in payment of the death penalty for sin. Therefore, animal sacrifices are no longer required by God. Animal sacrifices, however, were only a part of the myriad of laws that made up the Old Covenant system. As already discussed, there were specific regulations governing sexual conduct, disease control, dietary practice, personal injuries, property rights, treatment of slaves, farming practices and personal hygiene. All this was in addition to the great body of law governing priestly duties and worship requirements such as keeping the Sabbath, Feast Days and New Moon celebrations. The law given by God to Moses became referred to as the Law of Moses. As Jews and Gentiles came to acknowledge and accept Christ as the promised Messiah, much controversy arose as to what place the Law of Moses had in the developing Christian community. Many Jewish converts to Christ continued to believe the Law of Moses still applied and should be enforced, not only within the Jewish Christian community but among the Gentile Christians as well. For Jewish Christians, Christ was seen as the fulfillment of Messianic prophecies but not as an end to the Law of Moses. Christianity was viewed as an extension of Judaism. Circumcision and keeping the Law of Moses became an early issue. Acts 15:5 records, “Then some of the believers who belonged to the party of the Pharisees stood up and said, "The Gentiles must be circumcised and required to obey the Law of Moses." It is to be noted that it is "believers" who said circumcision and obedience to the Law of Moses must be adhered to by Gentile converts. These "believers" were Jewish converts to Christianity. These were Jews who had come to accept Christ as the promised Messiah to Israel but still believed circumcision and the Law of Moses must be followed. Circumcision, as a religious rite, initiated one into the community of Israel and placed one under the Law of Moses. Circumcision obligated one to keep the Law of Moses. The two went hand in hand. Paul told the Galatians; “I declare to every man who lets himself be circumcised that he is obligated to obey the whole law” (Galatians 5:30). The context of Galatians 5 shows Paul is referring to the Old Covenant law, commonly referred to as the Law of Moses. Some feel that only circumcision, as a requirement of the Law of Moses, is at issue at the Jerusalem conference of Acts 15 and not the Law of Moses itself. Paul’s statement to the Galatians shows this is not the case. You will find throughout the writings of Paul frequent association between circumcision and obligation to keep the Law of Moses. The one equates with the other. The great fuss being made by the Jewish community over these matters shows it involved a great deal more than the issue of circumcision alone. In Acts 21 we find circumcision and Jewish customs clearly associated. In Acts 21 we see Paul visiting with James and the other elders at the church in Jerusalem. This appears to be many of the same group which met at the Jerusalem conference as covered in Acts 15. At that conference it was determined that Gentile converts to Christianity did not have to be circumcised or keep the Law of Moses. Now a whole different matter was being taken up for consideration. This matter involved not Gentile but Jewish converts to Christianity. Did Jewish converts to Christianity have to be circumcised and keep the Mosaic regulations? It is apparent Jewish converts to Christianity believed they did and they were concerned that Paul was teaching otherwise. Paul was accused of turning the Jews from circumcision and Jewish customs. Acts 21:20-22: You see, brother, how many thousands of Jews have believed, and all of them are zealous for the law. They have been informed that you teach all the Jews who live among the Gentiles to turn away from Moses, telling them not to circumcise their children or live according to our customs. Verse 23-25: There are four men with us who have made a vow. Take these men, join in their purification rites and pay their expenses, so that they can have their heads shaved. Then everybody will know there is no truth in these reports about you, but that you yourself are living in obedience to the law. As for the Gentile believers, we have written to them our decision that they should abstain from food sacrificed to idols, from blood, from the meat of strangled animals and from sexual immorality. These passages in Acts are very instructive. First of all we are told that thousands of Jews have become believers. This shows to what extent the gospel message had by now impacted the Jewish community. We are also told these believers are all zealous for the law. This shows that Jews who had accepted Christ as their Messiah continued to believe the Law of Moses was still in force for them. It is then recorded that these Jewish converts to Christianity have been told Paul is teaching that Jews who live among the Gentiles don't have to be circumcised and keep the Mosaic regulations. Was this accusation valid? Was Paul teaching that Jews who live among the Gentiles no longer need to be circumcised and keep the Mosaic regulations? We know Paul taught that Gentiles did not have to be circumcised and keep the Law of Moses. This is clear from a reading of his letters to the Gentile churches. Paul clearly taught the Gentiles that to be circumcised was to embrace the Mosaic regulations as the pathway to salvation and a relationship with God which negated faith in Christ as that pathway. Galatians 5:1-6: It is for freedom that Christ has set us free. Stand firm, then, and do not let yourselves be burdened again by a yoke of slavery. Mark my words! I, Paul, tell you that if you let yourselves be circumcised, Christ will be of no value to you at all. Again I declare to every man who lets himself be circumcised that he is obligated to obey the whole law. You who are trying to be justified by law have been alienated from Christ; you have fallen away from grace. But by faith we eagerly await through the Spirit the righteousness for which we hope. For in Christ Jesus neither circumcision nor uncircumcision has any value. The only thing that counts is faith expressing itself through love. If Jewish converts to Christianity were present when Paul made statements like this, the accusation made against Paul would appear to be valid. It is very apparent Paul taught that circumcision and keeping the Mosaic Law was not the pathway to salvation and a relationship with God. Was this true for Gentiles only? No, this was and is true for Jews as well. Paul was not teaching two different gospels, one to the Gentiles and another to the Jews. Yet here in Acts 21 the Jewish converts to Christianity are acknowledging that Gentile Christians were not under obligation to be circumcised and keep the law while at the same time believing that Jewish Christians were under such obligation. If Paul was teaching that there no longer was a need to be circumcised and keep the Mosaic regulations, why did Paul agree to join in the purification rites of the four men? Acts 21:26: The next day Paul took the men and purified himself along with them. Then he went to the temple to give notice of the date when the days of purification would end and the offering would be made for each of them. So what is Paul doing here? Is he supporting the apparent Jewish Christian belief that circumcision and the keeping of Mosaic regulations was still required? Was He doing this only to appease the Christian Jews and not because he believed such rites were any longer necessary? Was Paul simply trying to be accommodating to the sensitivities of the Christian Jews who still believed they had to be circumcised and follow the Law of Moses. Was Paul doing what he had told the Corinthians he did in order to bring people to Christ? 1 Corinthians 9:19-22: Though I am free and belong to no man, I make myself a slave to everyone, to win as many as possible. To the Jews I became like a Jew, to win the Jews. To those under the law I became like one under the law (though I myself am not under the law), so as to win those under the law. To those not having the law I became like one not having the law (though I am not free from God's law but am under Christ's law), so as to win those not having the law. To the weak I became weak, to win the weak. I have become all things to all men so that by all possible means I might save some. We see Paul using this approach when deciding to take Timothy along with him on a missionary journey. Acts 16:1-3: He came to Derbe and then to Lystra, where a disciple named Timothy lived, whose mother was a Jewess and a believer, but whose father was a Greek. The brothers at Lystra and Iconium spoke well of him. Paul wanted to take him along on the journey, so he circumcised him because of the Jews who lived in that area, for they all knew that his father was a Greek. In view of what we know of Paul's teaching regarding the matter of circumcision and the keeping of the law, He certainly wasn't circumcising Timothy for religious reasons. He was simple trying to keep peace with the Jews who lived in the area. In reading Paul it is very apparent he taught that salvation cannot be obtained through keeping the Law. He strongly taught against keeping the law as the pathway to salvation. This being said, Paul certainly wasn’t teaching that we should abandon the keeping of law, including aspects of the Mosaic Law. As strong as he was in teaching against keeping law as a means of obtaining salvation, he was just as strong in teaching we are to keep law as the pathway to righteous behavior before God and man. We are still obligated to keep law under the New Covenant. It is the purpose of this series to determine what that law is and what it is not. What is and what ain’t. As already mentioned, under the New Covenant, circumcision is to be of the heart where God’s law is made part of the conscience of man. The Law of Moses was a grouping of regulations external to the heart of man that required obedience but did not necessarily instill heart felt obedience. The Law of Moses was a Covenant between God and Israel. This Covenant was never between God and Gentiles. Much of the Old Covenant contained regulations designed to show separation between Israel and the Gentiles nations. Sabbath observance, Feast Days, New Moon Celebrations, dietary regulations, and the myriad of worship and ceremonial requirements created separation between Israel and the Gentile world. It was a separatist system designed to facilitate a relationship with God based on keeping the Mosaic Law. Only circumcised Israelites and Gentiles who joined themselves to Israel by becoming circumcised could participate in this system. With the advent of Christ, the way to a relationship with God became available to all of mankind and there no longer was a need for such separatist regulations. On the other hand, moral regulations were always applicable to man whether Israelite or Gentile and were incorporated into the Old Covenant as part of that Covenants governance. When the Old Covenant was abrogated this didn’t terminate moral law. The moral law continues obligatory for Jews and Gentiles under the New Covenant. As Christians, however, these moral obligations for both Gentiles and Israelites were to become not just a superficial response to law but a living expression of the law fulfilled through love. In other words, if we truly have love (outgoing concern) for our neighbor we will automatically fulfill the intent of the law by not stealing, lying, murdering or doing anything else that would harm our neighbor. This is reflected in what Paul said in regard to law. Romans 13:9-10: The commandments, "Do not commit adultery," "Do not murder," "Do not steal," "Do not covet," and whatever other commandment there may be, are summed up in this one rule: "Love your neighbor as yourself." Love does no harm to its neighbor. Therefore love is the fulfillment of the law. Paul cites several commandments that are found in the Ten Commandments given to Moses on Mt. Sinai. Some look upon the Ten Commandments as an eternal immutable body of law that must stand forever and can never be changed. Since a command to keep the Sabbath is part of this configuration of law, it is believed this command is immutable as well. However, since God creates law he can do anything He wants with it. As creator of law, God can make it immutable if He wants. He can also change it, modify it or eliminate it. Did God make the Ten Commandments an unchangeable, immutable body of law? No He did not. The Ten Commandments are a particular configuration of law that formed the core of the Old Covenant. There is nothing inherently eternal or immutable about this particular configuration. This configuration included moral laws that had been extant since creation. This configuration also included prohibitions against engaging in polytheistic worship practices. Only worship of the one true God was allowed. Making an idol of something and worshiping it was strictly prohibited as was the use of God’s name in vain. This configuration also included a command to keep the Sabbath. Why this command and why was it included in the Ten Commandments? The Sabbath was included in this configuration because it identified Israel as set apart from the Gentile world. The Sabbath regulation was a sign identifying the creator God as the God of Israel. It signaled a special covenant relationship between God and Israel, a covenant relationship that did not exist between God and the Gentile world and never did. Exodus 31:16-17: The Israelites are to observe the Sabbath, celebrating it for the generations to come as a lasting covenant. It will be a sign between me and the Israelites forever, for in six days the LORD made the heavens and the earth, and on the seventh day he abstained from work and rested.'" While requirements to obey moral law and worship YHWH as the one and only true God can be seen in evidence since creation, there is no evidence of Sabbath keeping until the time of Israel's exodus from Egypt. There is no evidence of Adam and Eve, Noah, Abraham, Isaac or Jacob keeping the Sabbath. In basing the Sabbath observance on the seventh day rest of God at the end of creation week, the Israelites were made to continually acknowledge the creator God as the God with whom they were entering into a covenant relationship. The Sabbath rest also served as a reminder to Israel that it is the one true God who brought them out of Egyptian slavery. The keeping of the Sabbath command was extremely important because it keep Israel aware of their Covenant relationship with God. Because of this importance, violating the terms of the Sabbath was punishable by death. It is recorded in Exodus 35:2 that anyone who does any work on the Sabbath must be put to death. In Numbers 15-35 it is recorded that God ordered Moses to have a man stoned who gathered wood on the Sabbath. OT Scripture shows Israel being often reprimanded for breaking the Sabbath. The moral laws and laws pertaining to acknowledgement of the one true God found in the Ten Commandments were laws extant since creation. These laws were required to be kept by all of mankind. The Sabbath law is not seen as extant since creation and apparently became operational only after the Exodus and operational only for Israel. While the moral and worship laws found in the Ten Commandments are seen as applicable to all of mankind from the beginning, the Sabbath law is seen as applicable only to Israel beginning after the Exodus. Some argue that because God is seen in the creation account as blessing the seventh day and making it holy because he rested on that day indicates He must have intended it to be a day of rest for man from the beginning. However, nothing in Scripture says this. No mention is made of a seventh day rest being required of anyone until it became required of Israel. It is apparent the rest of God on the seventh day of creation week simply was used as a template for the establishment of such rest for Israel. While we see the Gentile nations throughout OT history being reprimanded for worshiping false gods and failing to behave according to the moral law, we never see the Gentile nations reprimanded for not keeping the Sabbath. It is instructive that we see no evidence of reprimand for breaking the Sabbath in the NT. In the various lists of sinful behaviors seen in the teachings of Jesus and Paul, not once is there mention of it being a sin to not observe or break the Sabbath. In Mark 7:21-22 Jesus lists thirteen sinful behaviors. In Romans 1:29-32, Paul lists 20 sinful behaviors. In 1 Corinthians 6:9-10 Paul lists ten such behaviors. In Galatians 5:19-21 he lists 15 sinful behaviors and in 2 Timothy 3:1-4 Paul lists 18 such behaviors. While these sin lists directly reference or allude to various of the Ten Commandments, you will not find in these lists any reference to not keeping the Sabbath being sin. In replacing the Old Covenant with a New Covenant, it is readily apparent God eliminated a great deal of law that He had previously created. A covenant is an agreement between two parties and such agreement is defined by a particular configuration of requirements contained in the agreement. When such agreement is terminated, it terminates the particular configuration of requirements that defined such agreement. When the Old Covenant was terminated, the particular configuration of requirements contained in that agreement were terminated. The New Covenant is based on a new configuration of requirements. They include the acknowledgement of Christ as the facilitator of our salvation. They include the Law of love becoming part of the very fabric of our Being, a law which automatically includes prohibitions against murder, thief, adultery, stealing and any other behavior that harms your neighbor. As previously discussed, these laws were extant prior to establishment of the Old Covenant and continue to be extant under the New Covenant. These laws were incorporated into the Old Covenant and when that Covenant was terminated, these laws were incorporated into the New Covenant. On the other hand, the keeping of the Sabbath day, Feast Days, New Moon celebrations, dietary restrictions and a host of other such regulations are not seen as being incorporated into the New Covenant. Ephesians 2:14-16: For he himself is our peace, who has made the two one and has destroyed the barrier, the dividing wall of hostility, by abolishing in his flesh the law with its commandments and regulations. His purpose was to create in himself one new man out of the two, thus making peace, and in this one body to reconcile both of them to God through the cross, by which he put to death their hostility. What two being made one is Paul talking about? What law with its commandments and regulations did Christ abolish? The context of Ephesians 6 clearly shows it is Gentiles in contrast to Israelites that Paul is talking about. Paul makes it clear that it was commandments and regulations that were a barrier and a dividing wall of hostility between Israelites and Gentiles that was abolished by the Christ event. Was the moral law a barrier and dividing wall of hostility? Moral law was in operation in the Gentile world as it was in Israel. It wasn’t moral law that created a dividing wall between Israel and the rest of mankind. It was religious law. It was the separatist laws of the Old Covenant that created a barrier and dividing wall. It was these laws that were abolished. The Sabbath, Feast Days, dietary laws and a host of other regulations separated Israel from the rest of mankind and in essence separated the rest of mankind from God. God changed the ground rules relative to establishing a relationship with Him. Paul makes this clear in what he wrote to the Colossian Church. Colossians 2:11-17: In him you were also circumcised, in the putting off of the sinful nature, not with a circumcision done by the hands of men but with the circumcision done by Christ, having been buried with him in baptism and raised with him through your faith in the power of God, who raised him from the dead. When you were dead in your sins and in the uncircumcision of your sinful nature, God made you alive with Christ. He forgave us all our sins, having canceled the written code, with its regulations, that was against us and that stood opposed to us; he took it away, nailing it to the cross. And having disarmed the powers and authorities, he made a public spectacle of them, triumphing over them by the cross. Therefore do not let anyone judge you by what you eat or drink, or with regard to a religious festival, a New Moon celebration or a Sabbath day. These are a shadow of the things that were to come; the reality, however, is found in Christ (NIV). These Colossian Christians like many of the Christian converts, whether Jew or Gentile, were being pressured to keep the Mosaic regulations. Paul makes it clear that this code of regulations was canceled. He identifies some of these regulations as dietary laws, festivals, New Moon celebrations and the Sabbath Day which are all clearly regulations of the Mosaic Law. He calls them shadows of things that were to come. The writer to the Hebrews shows the shadow nature of the Law and further shows how Christ is the fulfillment of the good things to come. Hebrews 10:1: For the law possesses a shadow of the good things to come but not the reality itself (NET). Hebrews 9:11: But now Christ has come as the high priest of the good things to come (NET). Some argue that Paul is not saying these Gentile Colossians should not keep the Mosaic regulations but only that they should not let anyone judge them for doing so. The Greek word translated "realty" in the Colossian passage is soma. In Greek this word has the basic meaning of a living or dead body but is also used by NT writers to describe the church as a body of believers. Some believe Paul is using soma in this passage to say don't let anyone judge you but the body (church) of Christ. It is pointed out that the word "is" is not in the Greek and that the text is simply saying "the body of Christ." Those who take this approach will use translations such as the King James to back up this position. Colossians 2:16-17: Let no man therefore judge you in meat, or in drink, or in respect of an holyday, or of the new moon, or of the sabbath days: Which are a shadow of things to come; but the body (is) of Christ (KJV). However, Paul clearly identifies the eating and drinking, religious festivals, New Moon celebrations and the Sabbath Day as a shadow of things that were to come. A contrast is being made between shadow and reality. It is Christ who is seen as the fulfillment of the good things to come. He is seen as fulfilling the shadows. Once the shadows are fulfilled there is no need to continue observing the shadows. This is the point Paul is making in his letter to the Colossians. Even if Paul is saying don't let anyone judge you but the body of Christ (the church), it doesn't nullify his saying these regulations are a shadow of things to come which other Scripture identifies as having come through Christ. Once having come, there is no need for the shadows. Understanding this is what Paul is saying, most translators of this passage render soma as "reality" or "substance" to show that it is Christ is the reality who has displaced the shadows. It is apparent these Gentile Colossian Christians were not only being pressured by Jews to keep Mosaic regulations that were no longer necessary but were also being pressured, possibly by their pagan friends, to engage in other behaviors unnecessary in their Christian walk. Paul points out Christ died to free them from all such regulations. Colossians 21: 8-23: Do not let anyone who delights in false humility and the worship of angels disqualify you for the prize. Such a person goes into great detail about what he has seen, and his unspiritual mind puffs him up with idle notions. He has lost connection with the Head, from whom the whole body, supported and held together by its ligaments and sinews, grows as God causes it to grow. Since you died with Christ to the basic principles of this world, why, as though you still belonged to it, do you submit to its rules: "Do not handle! Do not taste! Do not touch!"? These are all destined to perish with use, because they are based on human commands and teachings. Such regulations indeed have an appearance of wisdom, with their self-imposed worship, their false humility and their harsh treatment of the body, but they lack any value in restraining sensual indulgence. With the Christ event God changed the manner in which He deals with mankind. He abolished law that led to separation and made relationship with Him available to everyone. He abolished works of law as a basis for establishing righteousness. He changed the way moral law is administered. Under the New Covenant, God writes the moral law in our hearts and not on tablets of stone. God’s moral law becomes a natural expression of righteous behavior and not just a mechanical reaction to a written code. Our behavior becomes motivated by genuine concern for the welfare of others and not just the avoidance of penalty for failing to keep a written code. The love of God is shed abroad in our hearts in the matrix of God’s law being written in our hearts. It is this written law in our hearts expressed in love based behavioral modifications that results in a reconciled, harmonious and forgiving relationship with both God and man.